Dessert and snack lovers everywhere need to know that you can “have your cake and eat it too” with easy-to-make, simple, guilt free raw food healthy treats and delicious desserts that you and your family will savor and return to again and again whenever the occasion calls for a satisfying sweet treat. Have you ever made a cake without have to bake it or whipped up desserts like chocolate mousse, cookies and ice cream without using sugar, flour, dairy, soy or eggs as ingredients? Does that seem to be out of the realm of possibility? 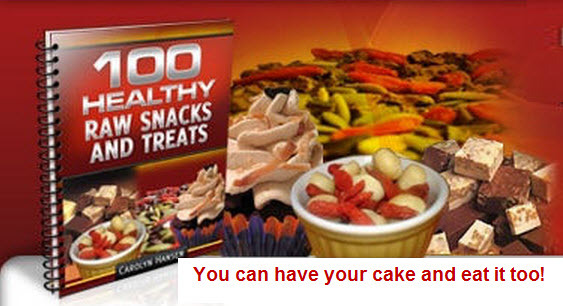 It is not only possible but in regards to your health it is the preferred way to prepare snacks and desserts. But before you can really understand and appreciate what makes snacks healthy you need to have a basic understanding of what makes your average snack recipe unappealing when it comes to your health. If your goal is to live a and long and healthy life free of modern-day diseases like diabetes, hypertension (high blood pressure), and coronary disease then staying away from your typical cookie, dessert or treat is the first step. The introduction and expansion of the role that raw foods plays in your diet is critical to your long term overall health. With obesity rates higher than they have been at any previous time in history it is not an exaggeration to say that our food is literally killing us years before our allotted time. Since “raw” and “living” are interchangeable when talking about the kind of healthy ingredients that are featured predominantly in my “100 Raw Snacks and Treats” recipe book it’s important to understand what I mean by raw or living food as opposed to cooked food. Any kind of food that is grown in soil and harvested is considered “living food”; plant life. Living food has not been cooked to the point that the valuable enzymes that we derive from the food for our benefit are destroyed. For the most part you can say that the food is uncooked or raw. Raw foods include any foods added to your daily diet without first needing to be cooked. Examples are: raw nuts, seeds, vegetables, sprouted grains, and beans. None of these foods gets processed, heated, cooked or altered in any way. They are considered whole foods in their natural living state. In the case of nuts, they are considered live food because when you soak them in water they sprout. It was just waiting for the right environment of water, light and warmth to activate its life force. This is why it is always better to sprout beans, nuts and even seeds overnight. It activates the food’s living energy in the form of enzymes which in turn give instructions at the cellular level. This assists with our ability to digest food properly. On the other hand, cooked food has been stripped of the enzymatic activity that raw living foods offer. Gluten intolerance is largely explained by this idea of wheat not being sprouted before it is cooked. The gluten which is part of the cell structure becomes indigestible and toxic to some who are sensitive to it. However it the wheat is first sprouted then cooked at a temperature below 112 degrees F it is still alive when you eat it. Sprouted wheat and rye bread is unbelievably good and contributes to your health rather than causing a toxic reaction. The ancients that flourished 2,000 years ago made such bread called “Essence bread”. Their grains were cooked after first sprouting on a rock in the sun. Enzymes are important to because your body needs them to function properly and will deplete its own enzyme reserves if they are not continually replenished. Raw foods add valuable enzymes back into our enzyme bank account. Without replenishing this account, eventually we use up our enzyme supply and the result is we are much more susceptible to aging, disease and premature death. 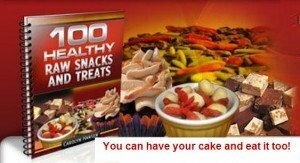 Raw foods are also highly alkaline (acid/alkaline balance is mandatory for balance and health in our body chemistry) and all the recipes found in my book “100 Raw Snacks and Treats” contain alkaline foods that you can enjoy in abundance.